As a recovering SEO, I still have many friends and contacts in the SEO industry. I still keep an eye out on what is hot & what is not in the SEO world. Whilst I cannot really claim to be much of a SEO nowadays (though I’ve given an WordPress SEO talk or two in my time), I do still use my SEO skillset from time to time to help promote my own website. As well as a skillset that is slightly under-utilised, I have a list of tools that I quite like using. These are tools that I use pretty much on a weekly basis, sometimes on a daily basis. I’ve tried to categorise the tools the best I can, and I’m interested to try out more tools if need be. But, as of today, here are my favourite WordPress SEO tools. These are SAAS websites that are quite helpful to keep a tab on your site, and help with analysis. This is probably the best rank checker I know . Although the mode du jour in the SEO industry is to ignore keywords (something I do agree with), it’s a good way to get a good overview on where your site stands, and also the sites around you in the SERPs. It is free, but if you want more than 30 days of history, then you have to pay. It’s $4.99 per “robot” per month. That will allow you to search more keywords, more often. What I use this tool for is putting in keywords I assigned to each post in Yoast’s WordPress SEO, and then rank these over time. 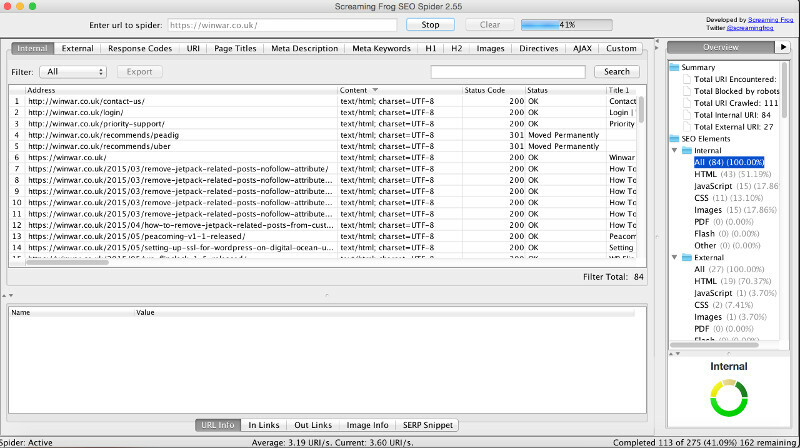 I try to put in keywords before the blog post goes live, as that way I can analyse the top results before publishing. 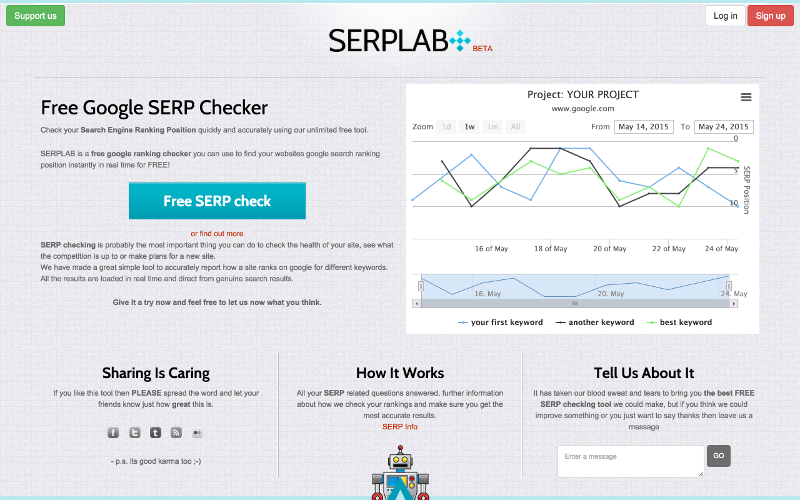 Click here to try SERPlab. 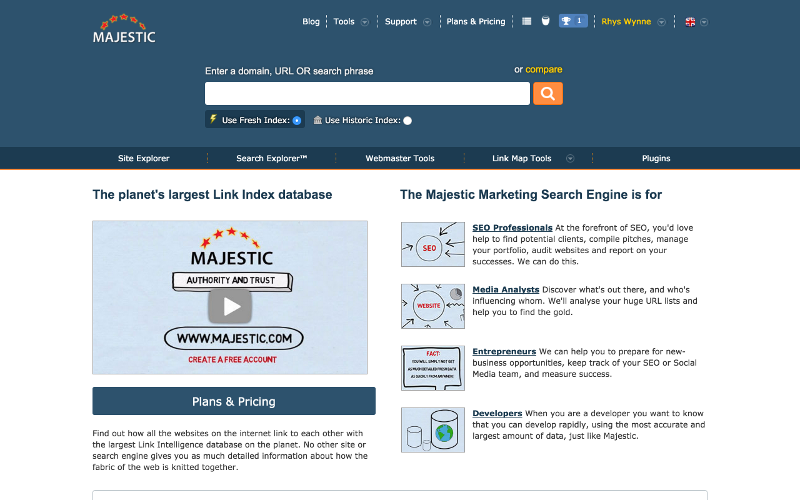 Majestic (formally Majestic SEO) is probably the best link analysis tool out there. It will analyse your backlinks to your site, giving you an overview of how strong they think your site is. It will also breakdown your anchor text to your site, any new links or any links that have disappeared. It isn’t free (packages starting at about £49.99/month), but if you connect your Google Webmaster Tools account, you can get a great overview on your own site. I use this to help get an overview of my links, as well as possible targets for link acquisition . Click here to try Majestic SEO. This is one thing that I use a fair bit, and has helped a lot with my site. The free version is limited to 500 links, for a paid version that allows unlimited crawling, it is £99 per year. I primarily use this tool to check sites for dead links (or pages that return 404 errors) , as although plugins can do this functionality, generally speaking they are database or a resource hog. It’s much better having functionality like this separate from your site. Click here to try Screaming Frog. This is a new tool debuted recently which has been bookmarked. 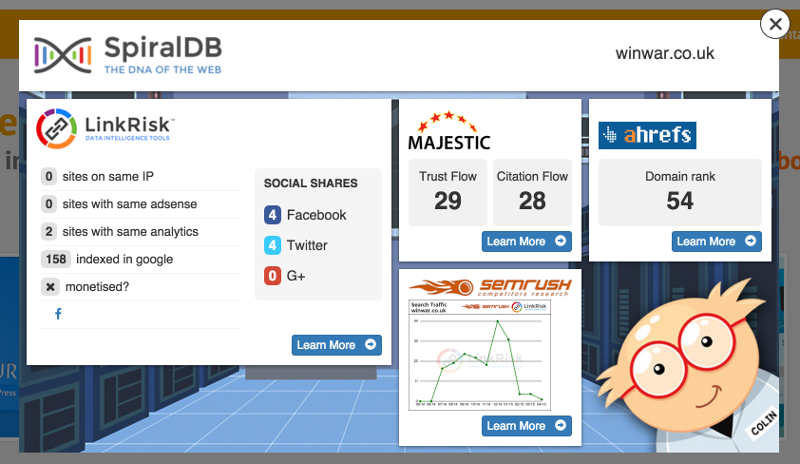 SpiralDB, from the LinkRisk team, gives you basic level data on your site from LinkRisk, Majestic, SEMRush & ahrefs. There are links to all tools should you wish to learn more. It’s totally free, though some of the “learn more” functionality is something that is paid from their respective sites. I use this to analyse any potential site that I approach for covering my plugins . Click here to try SpiralDB. Now onto code snippets! These snippets should be saved a bookmark. This will quite simply check your current URL in Majestic, giving information on links pointing to this page. This bookmarklet checks the current URL on archive.org, so you can analyse changes. This is useful if the domain appears to have expired, as often shady marketer types pick up old domains that have a bit of standing to try and get a boost when their site launches. This function check the current page, and see if it is blocked by robots.txt. Often things can be blocked by robots.txt, preventing your site appear to be hidden from search engines. Even if WordPress’ Search Visibility Options are switched so it’s visible, the robots.txt isn’t controlled from WordPress, so this could be blocking your site. By default it’s unlikely to do so, but if you inherit a site, you may wish to check this. Recently, Google have been showing rich snippets in search results. Using tools such as WordPress SEO or even coding it into your theme, you can structure your page’s data so that it could show up in search results. This tool tests the current URL with Google’s Rich Snippets testing tool, allowing you to see how your URL could appear in search results. Of course, what WordPress list wouldn’t be complete without a few plugins. Of course, there are plenty of “SEO” plugins, but here are the ones that I actually use. Well what hasn’t been said before about Yoast WordPress SEO? Probably the quickest and easiest plugin to do important things such as set your title tags & description, and it has the ability to create XML sitemaps as well as analyse your pages to see if they can be improved in any way from an SEO perspective. It’s built by SEO’s, for SEO’s, and should be installed on your site, but you knew that anyway. Click to read more about Yoast WordPress SEO. Probably one of the most controversial plugins (but I am a fan of the plugin), Jetpack has some nice little modules for SEO. Probably the best one in my opinion is the Enhanced Distribution module. This allows your post to be added to the WordPress.com firehose. Companies (including search engines) connect to this firehose to index new content, so it could be a great way to get your content indexed by search engines quickly. Click to read more about Jetpack. This is a plugin that’s a bit of a red headed stepchild for me, as this fills a real need for me, but surprised how few people have downloaded it. This plugin will check to see if your site is visible in search engines, which is common (and Yoast does this). However, what this also does is should the site URL change (such as when you move databases), then it will check again if the site is visible in search engines. This is incredibly useful for when you put a site on a staging URL, and need to port the database to a live URL, this prevents you from making the content invisible on the live URL. I do strongly recommend to those who do client work to check this out, as I know that some SEO’s were scared that this plugin put them out of a job! Click to read more about Check Search Engine Visibilty on Migration. So this are my picks for a SEO Toolkit for WordPress webmasters, what are on your list? Leave them in your comments! Wow what a great list! I want to add a tool if that’s possible, it’s quite similar to Yoast, but you can use it online instead as a plugin. It’s called http://www.webtexttool.com, wonder what you think of it!